I have wanted to do this for some time now and have some particular motivation. I have resisted the urge to buy any cheap swords now for a couple of months, but the itch is real bad. Any cheap sword that I would buy would be simply to use and beat. Instead I have decided to save my money and buy some better quality stuff from custom people, and in that process, make as much of the finished product as I can. This is more so for the experience I will gain from the doing, and secondly about saving money by doing it myself. it was over four years ago when I really began to enjoy crafting things, and that has grown and become more fervent then ever. I partially choose the route of schooling that I have based around my desire to eventually have my own shop, forge, and equipment. I have really enjoyed working on some projects here and there, modifying production stuff, and I am ready to take this as far as I can. I really really would like to get my hands on a good quality Falcata. I want to be involved in the making of such sword via the actual design (drawing included), and make everything for the sword except for the blade. Eventually I want to make my own blades but that won't happen until I graduate college and get my feet on the ground. So in the mean time this is what I have got. Is it common for modern smiths to make bare blades for customers, and when they do is it any cheaper then finished swords? I have been studying Kirk Spencer's thread on falcata/kopis and have begun drawing some designs, which I will be posting sometime over break. I have an art degree in drawing, so hopefully these drawings will be up to snuff and supply some enjoyment here at myArmoury. Any reply is very much appreciated. Thanks in advance. Is your intention for it to be a historically accurate example? In that case there is no bronze in the hilt. If you want to do bronze casting for another project, I can tell you how to do it starting with a budget of just a few euros/dollars. With bone, mind that you won't be able to make anything flat that's wider then 4cm, unless you have access to f.e. whale bone. Thank you for that information. Can you tell me anything about how these hilts where constructed? I have looked at many pictures of historical examples, but with out first hand evaluation can not make out their general construction. I know that there are many types of Kopis / Falcata from various regions, and i do not as of yet have my specific interest narrowed to any particular type. I was thinking of something an Iberian would have used, or a Greek Hoplite. It is good to know that these hilts did not contain bronze, but I still would not mind learning how to cast it. I understand the basic process, but do not know any of the specifics. Also those are some great link you have there. I would love to do the hilt, and maybe even the casting of a bronze age sword. When I get the casting up and running it will be at the top of my list of things to do. Hey Luke. I've experimented with casting aluminum in my backyard. Then I tried making my own brass by mixing some copper sheeting and pennies for the zinc. It was kind of disastrous, but still a fun experience. It takes some time and a whole lot of patience, but it's definitely doable. My dad and I built a make shift blast furnace to melt down the metal. It was made from a galvanized steel bucket with mortar mix for insulation and fueled by charcoal and ShopVac for air flow. It worked extremely well. I'll see if I can dig up some pictures and maybe find the instructions we followed if you're interested. This setup can be used very effectively for aluminum casting; which I would recommend trying before you get into copper alloys because of the lower melting point. The setup can be used for copper alloys as well (I've even got steel up to its melting point) but uses a lot of fuel in the process. So if you want to skip the aluminum experience altogether, then I'd go with a propane fueled furnace; much more fuel efficient. The cool thing about this design though, is that you end up with a forge you can use for smithing as well. Thanks for sharing your experience Josh. I actually had built a hefty brake drum forge about a year ago. The break drum is not an ideal shape for forging but now that I think about it... it should work well for this type of thing. I think at this point I am just going to read some more info in the smithing books i have, as they include smaller sections on casting. Also i will look for a good book on basic metallurgy, and a place (online or local vendor) to get some quality materials from. I think I am pretty good on getting the metal molten. It was some of the finer points I was interested in. Like specific composition of alloys, metal alloys used for period stuff, any specific order in which you need to add then to the crucible etc etc Tricks of the trade so to speak. Any suggestion on a good book or web resource for metal casting or alloys in general? Here is a design that I have drawn to scale. I am pretty set on the configuration of the blade. The hilt is another story. I want something that could be considered historically plausible, without being too fancy. I am in the midst of talking to a smith (won't say who until anything is final) to make the blade. I am even considering doing the fuller work myself, as well as shaping the handle portion, as the design may change a little as I learn more about these weapons historically. I tried to keep the fuller system a little simple as these swords go, and it is still fairly complex. Also the cross sections are not exactly how the actual would be, I just put them in to show the ups and downs. I made a mock handle out of about 6 sandwiched pieces of corrugated cardboard. It fit into the hand like a dream. Pictured next to the gladius that was in the "Pompei Gladius Modifications"
I'm not so sure they were just iron. At least one I know is described as being a sandwich of steel and iron, and I've read some rumors that falcatas were known for having exceptional quality steel (though haven't been able to verify this). I wouldn't be surprized if they (or at least the edges) were quench hardened. You won't get the handle out of a kurkri. Mind that they have a full tang, and a wide guard, with the largest cross-section being at the guard (highest thickness and usually largest width). So you need to start out with something that has the biggest cross-section there if you want to get a falcata out of it. Luke, if you really want to make a historically plausible falcata, it would be best to pick one single example that you like and take all measurements from that one. If you try to combine different examples, you may end up with something that's the equivalent of a 20th century car reproduction existing of Ferrari, T-Ford and Citroen parts. Until you know the origin of most falcatas, the exact dating and then have a good overview of the chronological developement per region, understand the functional aspects in individual examples, you'll combine features that historically and functionally don't make sense. Just like with a lot of other historical blades (like saxes f.e. ), there is a lot of variation, but a large portion of the variation is not random but very specific in time and place and applicable to the specific blade design. Because I make reproductions myself, frequently by partial or completely historical methods, I know now what features are the result of functional differences, period and place, stylistic reasons, fabrication techniques, level of skill in fabrication and random variation due to being handmade. Of course you don't have to go into it that deep, and you may be perfectly happy if it's at least better then the commercially available reproductions. But it's good to keep the above in mind if you're looking for the best possible historical falcata. Perhaps I should just stick to an interpretation then. I wouldn't know how to get the blade geometry right without having an original in my hands. I have time to think this over, and change things. If anything the design will give a smith an idea of what they are up against. I would just pick one of the handle designs that you had posted in the Falcata/ kopis furniture thread Jeroen, but they are not shown with the blade. All aside does the design that i have come up with look like a decent interpretation? Perhaps I should just stick to an interpretation then. I wouldn't know how to get the blade geometry right without having an original in my hands. I have time to think this over, and change things. If anything the design will give a smith an idea of what they are up against. I would just pick one of the handle designs that you had posted in the Falcata/ kopis furniture thread Jeroen, but they are not shown with the blade. All aside does the design that i have come up with look like a decent interpretation? First thing that I notice is that you don't have the false edge. A lot of falcata's, particularly with the kind of bladeshape as you've drawn have a sharpened edge along the spine staring directly from the bend (which is why the top fuller/groove ends there). Overal, the blade appears rather short and wide to me, and the fuller looks rather wide. The fuller doesn't come below the centerline of the blade, except at the start of the blade and is usually no more then roughly 1/3rd the blade width. This is great stuff! I guess overall I was looking for an example that does not have a lot of bells and whistles. I will go back to the drawing board and fix the things you mentioned. If you have any photos on ones that approximate what i have now, maybe you could post them, and I could go from there. I seem to favor this type of blade shape, and the horse head type seems to appeal more to me the the bird type (if that makes any sense) I personally like the way the one I drew looks, but I really would like a larger degree of historic accuracy. Are you doing as Jerry has mentioned earlier, and not using high carbon steel. Work hardening, or quench hardening? Are you forging in the fullers, are cutting them in? Thanks for the information. I have exhausted the internet searches for photos, and do not have access to originals. I''ll look for one that's similar. It's like the one I'm working on, so I'll see if there's one close but slightly different I'm not behind my own pc at the moment, so I don't have access to the images. But if I don't reply in a few days, remind me. My main goal should be to make an accurate falcata. If you have information on one that that gives dimensions, shows the whole sword in one shot, and has some information on hilt construction, that would be excellent. I don't need to do one that looks exactly like my design. I think they are all pretty interesting, so I can't be picky about which one I try and copy. I appreciate your help on this!! This falcata is part of the collection in the Klingesmuseum, Solingen, Germany. Here's two images of another example. No. 2 in the first image is the same as the bottom one in the close-up in the picture below. You can use the scales to take the measurements (length 57cm, max. 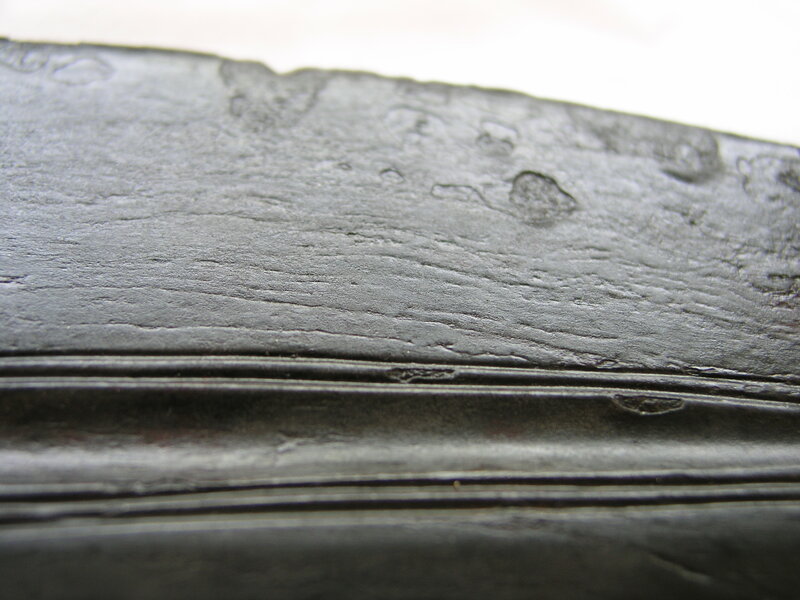 thickness at the first cross-section is 9mm and 4mm at the second cross-section). It describes an artificial magnetite coating that was apparently applied in ancient times on these falcatas, as well as many other iron artifacts from the region. So these falcatas would have been black in color, rather then grey. I am bumping this thread because the time has come for me to commission a custom falcata. I would really like to see more of these blades being reproduced, and have decided to take the plunge and fund one myself. I have some criteria for what I would like to accomplish with this commission, and they will be listed . If you would eventually like to see a custom falcata being reproduced, please help me in my quest for information concerning. Historically Plausible leaning more toward historically accurate. - Possibility of having the finished blade blackened as some evidence of originals may suggest... Thoughts on that? - Containing both metallic and organic components. Please join me in my quest to fund the creation of a beautiful falcata reproduction. Dig through your library for pictures. Include anything you might feel helpful in understanding how to do this right. At this time I will not reveal who I have contacted to make this blade, but if things go well then I know the end result will be appreciated by many members of this sight. Thank you! P.S. I am currently working 14 hour days, 7 days a week which is both hindering this project and funding it. I do not have a lot of time each day to do much research. any help will be appreciated. The grooves and fullers I strongly suspect were applied using scrapers. As for the composition, I have no hard data on that. I've heard of steel sandwiched between iron, but I can't verify that. For the metal hilt components: iron only. Good luck with the reproduction! Oh whoa is me. I have been moved to third shift, and feel like a zombie. I am still going to be going ahead with this custom falcata. Here is the good news. Patrick Barta has expressed interest in crafting this sword for me. I think we will all agree that his work is beautiful, and that it would interesting to see him do this style of weapon. Nothing is official yet. We have communicated via email, but no deal has been struck. I need to provide him with a design/criteria for the piece first Still have to decide on a piece to base it on, and internet searches are turning up poorly. I would love to somehow flood this thread with many many pictures of museum pieces, but cannot contribute any of my own. A few things I would like to look into further. 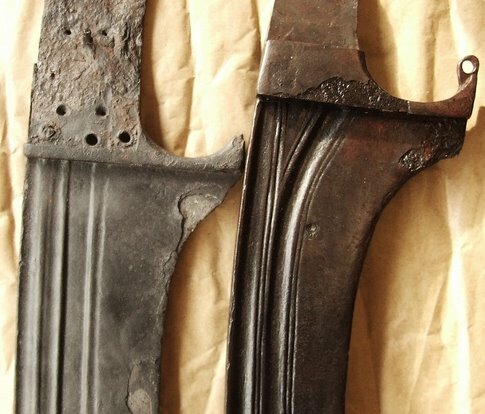 I was wondering if anyone knew the process used to blacken these blade, and also was attempting to find out were the evidence for this may be found. I am set on having metal hilt components crafted from iron, at the heeding of Jeroen's advice. Is there any evidence for organic hilt material, and if so what kind? Ok well any more help is appreciated. Thanks again! 17 inches is a good blade length for a Spanish falcata. These tend to be fairly short and stout, with blades from as short as 12 inches or so (IIRC) to 21-22 inches or thereabouts. The earlier Greek kopis could be much longer, with blades upwards of 24 or 25 inches or so. the idea of what is essentially a 24 inch kukri.. makes me very VERY scared.